What did my parents expect? I'm the offspring off pirates and they haven't even taken me to the beach yet. So, I've taken myself. Bag the Rhyme Time Day Care -- it's Playtime for ol' Parker here. 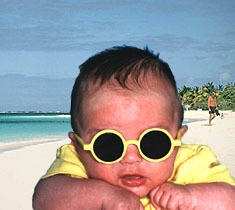 Here I am on the Playa, sunning it up while my parents think I'm safe and sound in the concentration camp. Yeah, there's a couple of older babes there who see to my every need, but they're well, older ya know! Dad didn't have much luck with older women, so why should I bother. At the beach, there's a lot more wahini than at Rhyme Time. Much more to my taste, although I'm not sure how to approach them. I mean, how many times can I play that cute baby routine before they want to actual want to talk. I have a whole life ahead of me to make small talk - what I want now is a little wahini to nustle me close and cuddle! What little pirate wouldn't? So it's the beach for me. Just don't tell my parents. They'll have a hissy when they found out I didn't invite them along.